The government has launched a three-month campaign to encourage awareness of the national minimum wage and help tackle rogue employers. 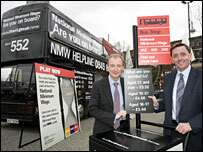 An information bus bearing the slogan "£5.52, Are You On Board?" aims to reach 800,000 people across the UK. Workers will be able to check if they are being paid correctly and get help and advice about making a complaint. More than £27m in unpaid wages has been recovered on behalf of 80,000 workers since 1999. "Every worker should earn a fair wage for a fair day's work," said Employment Relations Minister Pat McFadden. "We want to make sure workers know their rights and employers know their responsibilities. "This information campaign will help provide those most at risk of underpayment with the advice and support they need to take action where necessary," he added. Those visiting the bus will be able to access an online "ready reckoner" to confirm whether they are being paid properly. Staff will also be able to advise workers on action they can take if they are not being paid correctly, including making a confidential complaint to enforcement officers. The government says more than a million workers benefited from the latest increase in minimum wage levels, which took effect in October 2007. But unions have long called for enforcement powers in this area to be strengthened. In response, the government announced a crackdown in December on employers who continue to refuse to pay their staff the correct amount. All employers caught underpaying will face a fixed penalty. This will be set at half the total value of the arrears, subject to a minimum of £100 and a maximum of £5,000, and will be halved if paid within four weeks. Consistent offenders can be tried in a Crown Court, where they would face an unlimited maximum fine. The way arrears are calculated will also change, boosting the amount of back pay due to underpaid employees. In December, the TUC said it believed 150,000 workers were still being paid less than the statutory minimum. Its research identified those working in restaurants, hotels, cleaning, hairdressing and childcare as the most likely to be underpaid. The TUC said it had been contacted by a home worker paid between £2 and £3 an hour, and a Polish man working in a pizza store for a similar wage. TUC general secretary Brendan Barber said such exploitation was "unacceptable" and urged workers to report "Scrooge employers" to the authorities. "There should be no hiding place for bosses who are deliberately cheating their workers out of the minimum wage," he said. Employers can be reported - in confidence - to the minimum wage helpline on 0845 6000 678, or 0845 6500 207 in Northern Ireland.